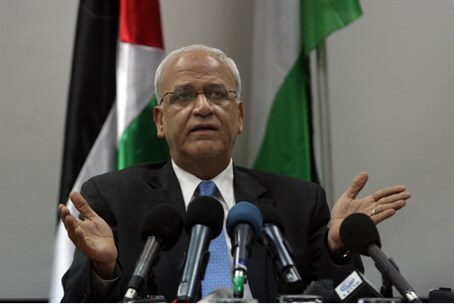 Saeb Erekat says the Arab ministerial council will discuss the PA's next bid to the United Nations on September 5. Saeb Erekat, a member of the Fatah’s Central Committee and the Palestinian Authority’s chief negotiator, said on Thursday that the Arab ministerial council will discuss the PA's next bid to the United Nations for recognition as a state on September 5. Erekat, who spoke in Jericho during separate meetings with the consuls of France, Germany, India, Brazil, South Africa and the United States, said the decision to turn to the UN on this issue has already made by the relevant PA and Arab institutions. He added that upgrading the status of Palestine in the UN would not harm the negotiations with Israel. In September 2011, PA Chairman Mahmoud Abbas applied for full UN membership at the UN Security Council. Israel and the U.S. staunchly opposed the bid, which failed due to a lack of support in the 15-member council. Abbas warned in June that he may seek non-member status for a Palestinian state at the United Nations if peace talks with Israel do not resume. The PA currently has observer status at the UN and an upgrade by the General Assembly to “non-member” would give Palestine recognition as a “state”. This could open the way for PA Arabs to take legal action against Israelis through the International Criminal Court. PA Foreign Minister Riyad al-Malki recently said that Arab countries support a unilateral PA bid for statehood recognition in the UN General Assembly. During his meeting with the foreign consuls, Erekat urged the international community to intervene immediately in order to force the Israeli government to reopen PA offices and institutions that it has closed in Jerusalem since 2001, and stop all Jewish construction in Judea, Samaria and “occupied” east Jerusalem.